Hey everyone! I have been putting this off for a while but A little pressure from a friend has now got me posting my Tank build thread. To Start I need to go back a little in history. I have had aquariums since I was old enough to convince my mom that I could take care of one. I didnâ€™t get started into Saltwater until a few years after I got married. That was just over 25 years ago. I was quickly hooked and had many FOWLR tanks for 11 years. After doing FO for that long I started getting into reef keeping. It was hook line and sinker from that point on. 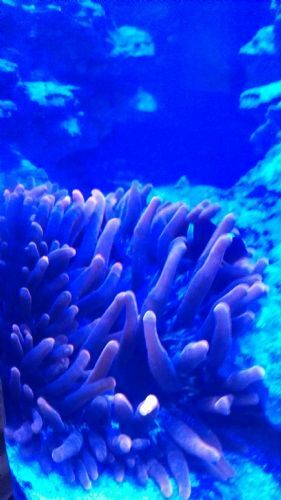 Within a year of starting my first reef, I also started a basement LFS and aquarium maintenance service. I build that business for 9 years. Some in the Kaysville area may remember my store front on 200 south just east of the freeway called Prestige Aquatics. That phase quickly passed and I sold the entire business off as well as my own tanks. I thought that I was done with anything fish related. Hahaha. I stayed away completely for 3 years. Then a good friend and neighbor bought a JBJ 28g Nano cube. She quickly realized she was in way over her head and somehow the information about my previous fish life slipped out. She immediately began picking my brain and having me over almost every night to help her get things under control. Long story short, we were able to get her nano setup, stabilized, running well, and growing like crazy. 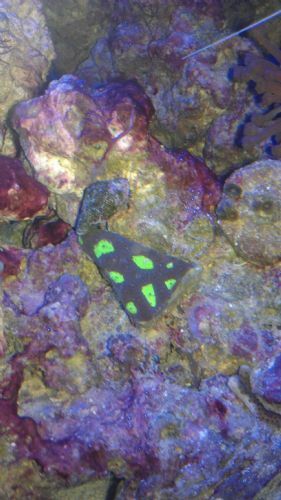 Once she saw what reefing was about she was completely hooked and started buying bigger tanks. About 5 tanks later she settled on a huge 220g all glass with sapphire front. In the mean time I was happily tinkering with the little nano. This went on for another year. Then her and my awesome wife, who tolerates my strange ways, decide to work out a deal and for Christmas of 2012 I became the owner of the nano that I had been tending to. The tank was starting to look pretty good after 2 years of working on it at her place. Then came move day to its new home a couple of blocks away. We thought the biggest issue was going to be the cold temps in October (yes Christmas isnâ€™t until December but thatâ€™s another story). Little did we know the temps wouldnâ€™t even come into play. So, we carefully packed all the rock and corals and fish into Styrofoam boxes with the tank water for the trip. The mistake I made was in not removing the sand and either replacing it or at least rinsing it. During the drive over the sand got a pretty good stirring and all the areas that were packed and full of Hydrogen Sulfide were disturbed and stirred in with the rest of the sand. Apparently, the tank sat long enough outside while we were prepping its location in the house, that the sulfur smell dissipated enough that I did not notice it as we set the tank back up. Things actually seemed fairly normal for the first couple of days but then that changed in a major way. Due to all that Hydrogen Sulfide being released the tank went through a cycle like I have never seen before. The Ammonia spike was so high that the water clouded and every bit of Coraline algae in the tank went from a nice dark purple color to the brightest hot pink you have ever seen! All the coral and fish started dying off adding to the crash and making me wonder why in the world I got back into this. After tearing the whole tank down and rinsing the sand for a full day, setting it all back up and doing about 15 â€“ 100% water changes, to try and save anything in the tank, that cycle finally ended. 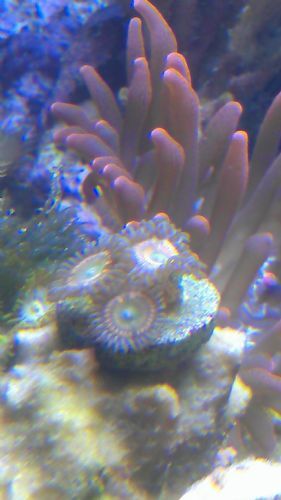 The casualty list had 3 fish, the entire CUC, 5 out of 7 Zoa colonies, all the Pulsating Xenia colonies (3 of them), and all the Coraline in the tank on it. 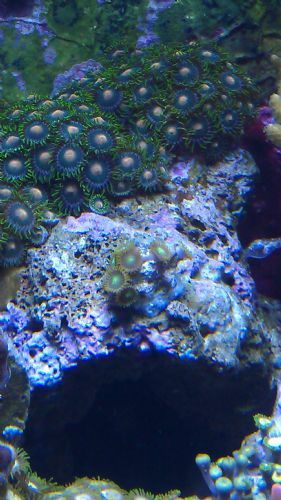 The survivor list consisted of a small colony of Honey Digitata, a small encrusting of M. Spongodes(sp), one tip of a 5â€ green birdnest colony, 3 heads of a radioactive green hammer with 12 heads, and two small colonies of Zoaâ€™s (Green bay packers, unnamed peach center with green fringe that I still get huge compliments/comments on). So, then the work began. My wife was convinced that because this was an AIO tank that it would be â€œinexpensiveâ€ to keep. We all know how that belief turned out. So in order to keep the costs down I started buying very small frags of things to replace the lost items and to add a few that I wanted in. The items that survived took off and grew like crazy!. The digi grew from about a 2â€ colony, to over 5 inches in all directions. 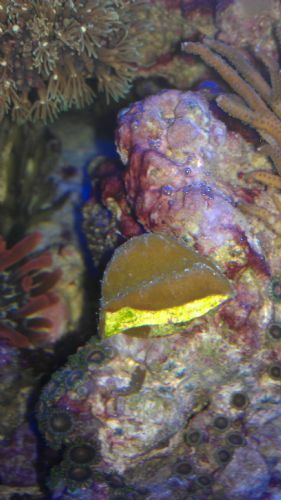 The Spongodes encusted the entire rock it was on and then started growing fingers along the top edge. About 10 fingers approximately 2â€ tall. 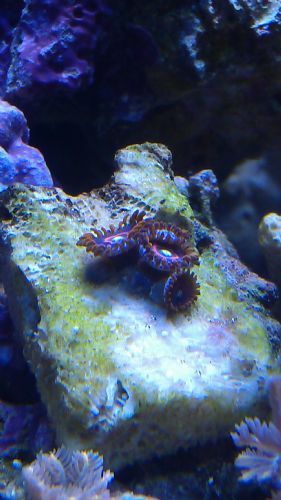 The two Zoa colonies completely covered the huge rock they were on. 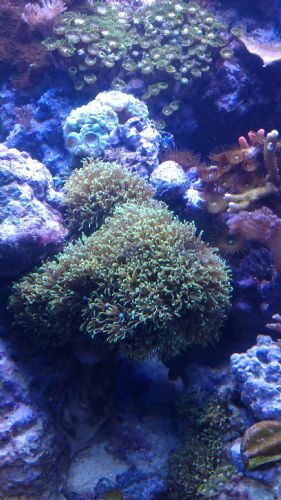 All the frags I had added where settling in nicely and starting to grow. The calm before the storm arrived. Things were doing well and there was a rhythm finally starting. Somewhere (still honestly donâ€™t know where) I inadvertently picked up a pest. I was pretty proud of my husbandry skills and was taking every possible precaution I could with new items. I was dipping every frag I was inspecting every plug with a magnifying glass. I was checking in between every polyp for hitch hikers. 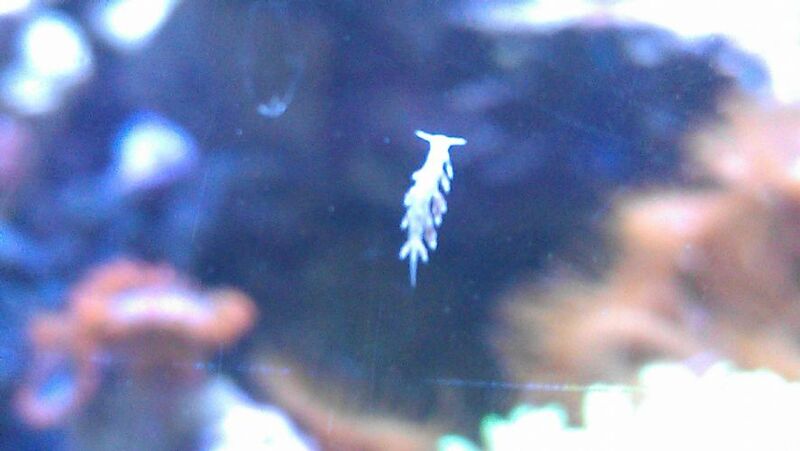 Still I somehow ended up with a Monti eating Nudibranch. Now, the Six line wrasse was one of the casualties of the move so my defense system was a little lite. The Nudibranches took off and before I had figured out what was happening (or noticing the small white nudiâ€™s on the glass in the middle of the night) they had completely destroyed the Spongodes, stripped the entire bottom of the Digitata, killed the green birdnest, and reduced a completely encrusted Superman Monti plug into a Â¼â€ piece right in the middle of the plug. After dipping and scrubbing everything in the tank and adding two new wrasses, that problem was solved. We are now caught up to where the tank stands today ( well with the passing of about 3 months). 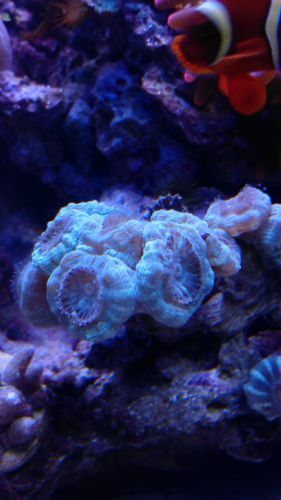 I think it has recovered very nicely and I am making the final choices as to what species I will be putting in to complete the coral selection. 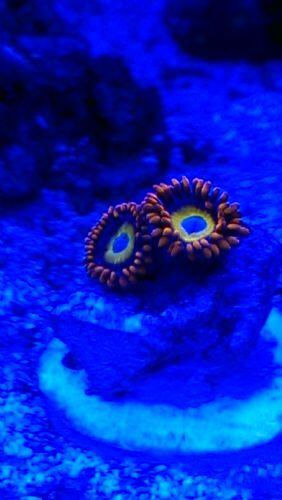 I currently have approximately 35 different Zoaâ€™s, 5 different Palyâ€™s , 5 SPS, 2 softies, 1 RBTA, 3 fish, very diverse CUC, and 1 Coral banded shrimp. 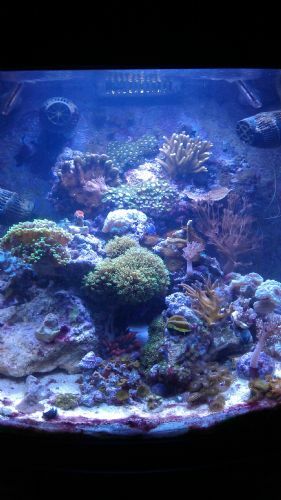 The Tank is a JBJ 28 gallon LED Pro so space it at a premium and I will be forever pruning to maintain the corals from this point on. I added a powerhead and run a GFO reactor in the stand and have just recently added some DIY LEDâ€™s to the stock LED Setup. Other than that it is stock. It runs without a skimmer. I plan to drill it and add a sump and skimmer in the future. I will post pictures and describe some of my DIY stuff a bit later. I want to try and find some of the pictures I took during the â€œfunâ€ times with the tank. All the forum members who have traded, swapped, or given frags to help with my tank. You know who you are and forget my own name. Pics: Here is the tank shortly after I got it home and setup. 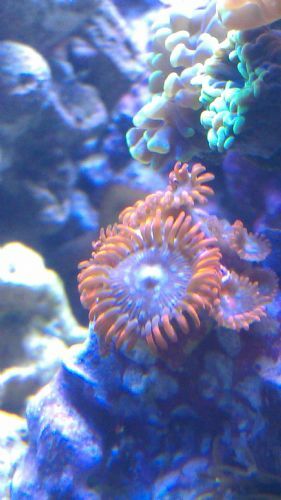 Here is my new clown to replace the two that died. The M. Spongodes after the first day of the Nudibranch attack! What the Nudi's look like and what you should kill if you see them! 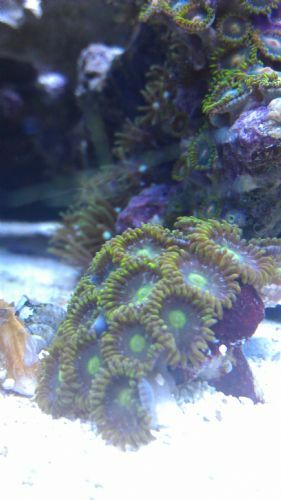 My Favia that I added during my Cyano outbreak after moving the tank! My first chalice. It doesn't look like much in the daylight but this Pumpkin Pie glows under actinics! 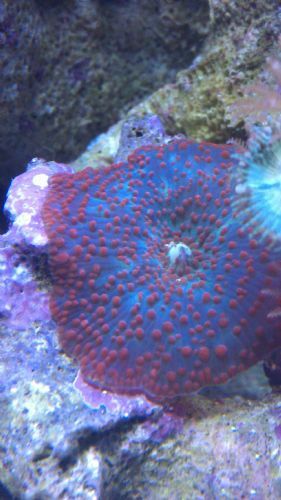 Thank You Saltwater Paradise! My Blues up close. They have doubled in size since this pic. 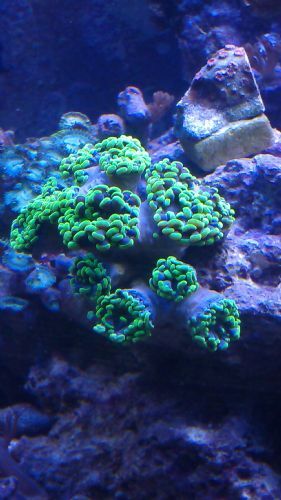 My Kryptonite Green Mushroom. Super bright all the time and man can he eat! My Nuclear green hammer. Super bright. He was not fully opened and not very happy because of the tank cycling after the move. I'll get some better pics of him now. Almost double the size! 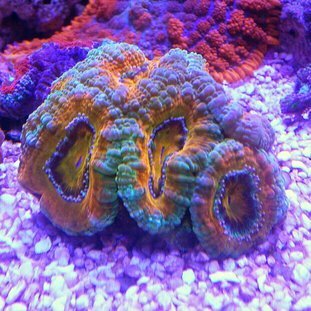 My First Acans (Aussie lord acans). The start of my obsession! Hopefully many more to come. 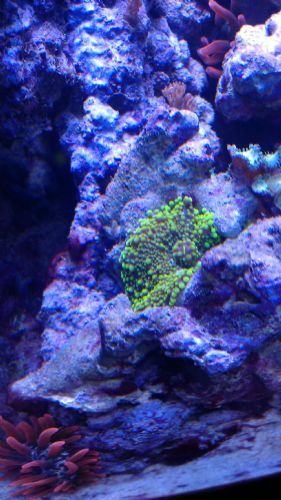 My Green Eyed ladies (the tiny frag) and my green bay packers colony! My Flaming black holes. I named them. They aren't fire and ice so I picked something else. They are awesome and really bright lashes! My Orange Bandits! 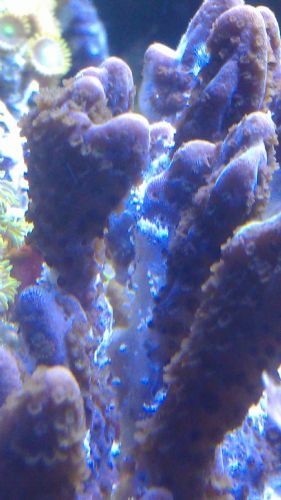 I swear they have new polyps everyday! Awesome color. Sunny D's. 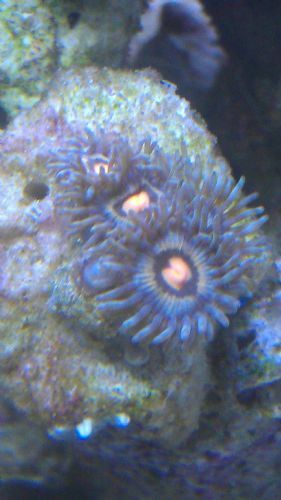 Growing new polyps and coloring up like crazy! Red Hornets. still a little mad about the move into their new tank. 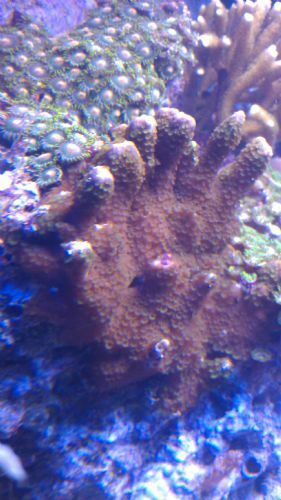 Some of my JF Clove Polyps just peaking in on the bottom edge. pics please! I m a big fan of nanos. sounds like its off to a good start. Pics or it didn't happen bro. I'll post the pics when I get home. They are all on my phone so it will take a little bit. I've been told it looks pretty good, but i just like variety and doing tanks so I'll have to take everyone else's word for how it looks. I can drop em off one of these days. How many do you want? ( chips ) they come in runs of 3. Few pics added. More to come. I have more to come and my new phone takes pretty good pics compared to the old one. 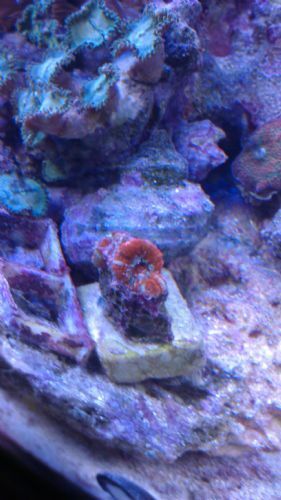 A bunch of new frags as well! Sweet tank! Thanks for the thread! Ok. FINALLY got The rest of the project done with my LED pro hood retro. So here goes the long description. So first was all the parts. I got the following parts to start the project. 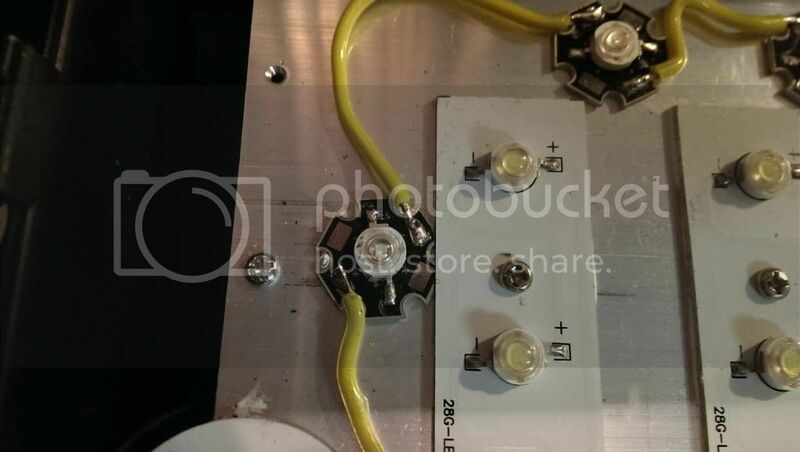 1 Maxwellen 48Watt Dimmable LED driver (7-12 3watt LEDs), 12 - Bridgelux 3 watt LEDs on stars (6 - Royal Blue 4 - True blue 2 - UV LEDs), Arctic white heatsync paste, roll of 16 gauge wire, Solder and soldering station, PC power cord, drill and drill bits, Heat shrink tubing and heat shrink gun, time. So those of you who have the LED Pro hood know that it is very bright and very white. 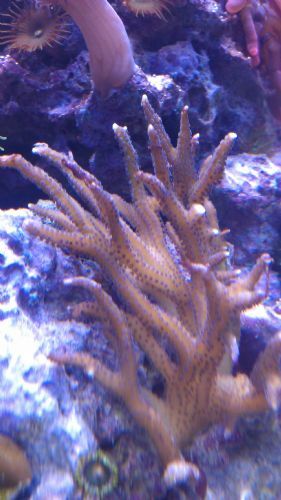 This configuration grows corals quite quickly but doesn't do much for color. So first I removed the hood and removed the splash guard from over the reflector and LEDs. I removed the reflector and decided on the LED placement. I decided that I wanted to leave the stock LEDs in place and work around them. So I chose spots around the perimeter. I took the reflector and used a sharpie marker to mark a dot where I thought each LED should go. I then found a drill bit the same size as the stock holes and drilled through the reflector. I hindsite what I should have done was place the LEDs and then mark their location on a piece of paper (the old charcoal rubbing Idea) so that I could drill them to match. The reason this should work better is because I ended up having to file a few of the stars down to get them to line up with the holes I had drilled because they were too close to the stock LEDs. 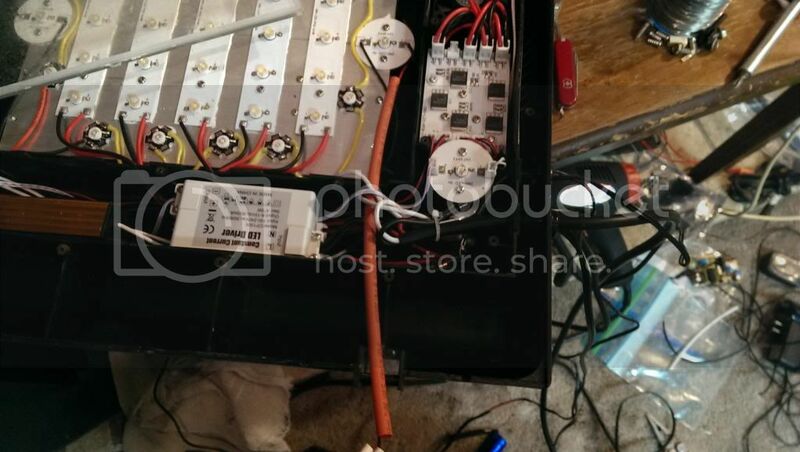 So here is the first picture showing my chosen layout with the LEDs already placed and the wires soldered. All the LEDs on white plates are the stock ones. All the ones on small black stars are the new ones. The yellow wire should lead you on the path. Here is a close up of one of the stars I had to file to get it aligned. The stars simply "glued" in place with the arctic white heatsync paste and left to set over night. Then they are all soldered in series. I mounted the driver using Velcro into the channel where the stock dawn/dusk driver is mounted. 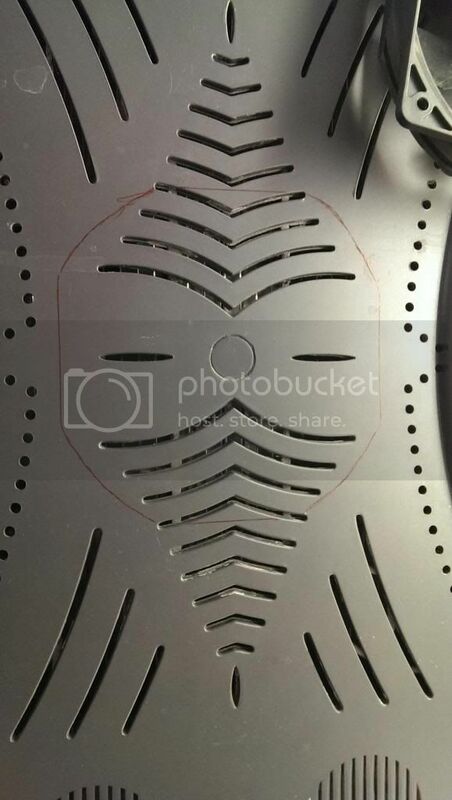 The red and black wires go under the reflector and connect to the LEDs. 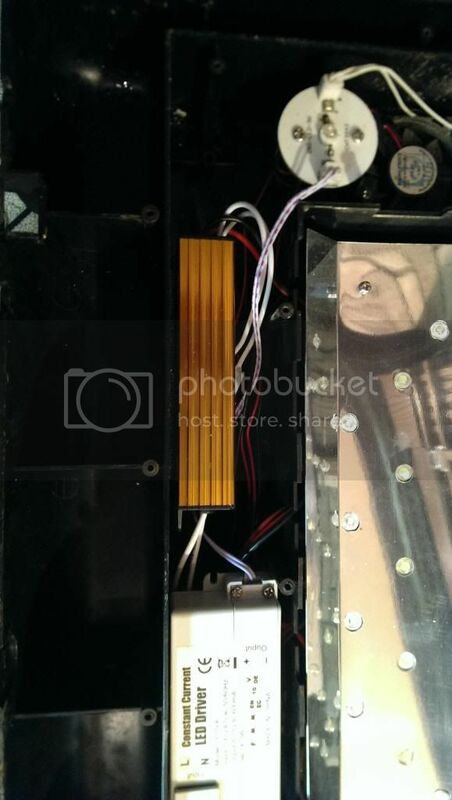 The two white wires on the top go to the POT that is used for dimming and the two white wires on the bottom connect to the power cord. 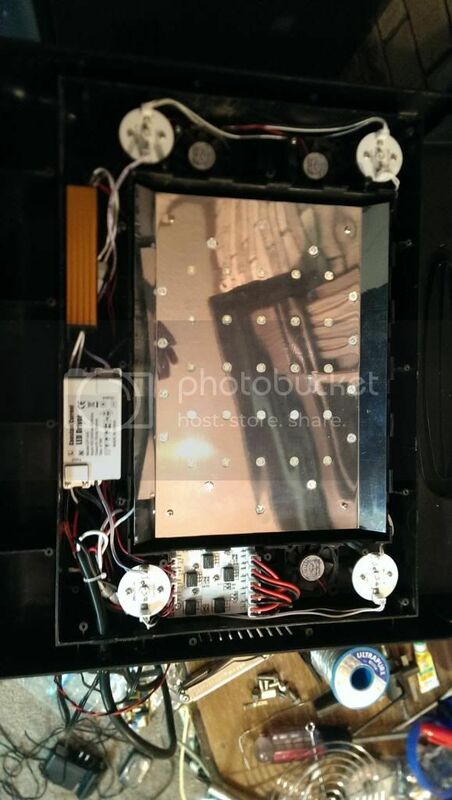 Here is the picture showing the inside after drilling mounting and soldering everything inside the hood. 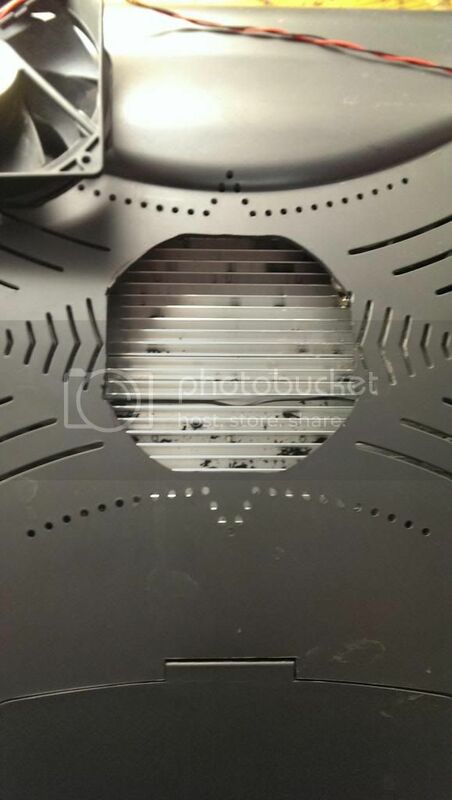 The POT is mounted through the top of the hood where all of the wires come in at the bottom left of the picture. It hard to see in there but it's there. After running the hood with the new LEDs for a couple of days it was clear that the stock fans were not keeping up with the extra heat coming from the new LEDs. 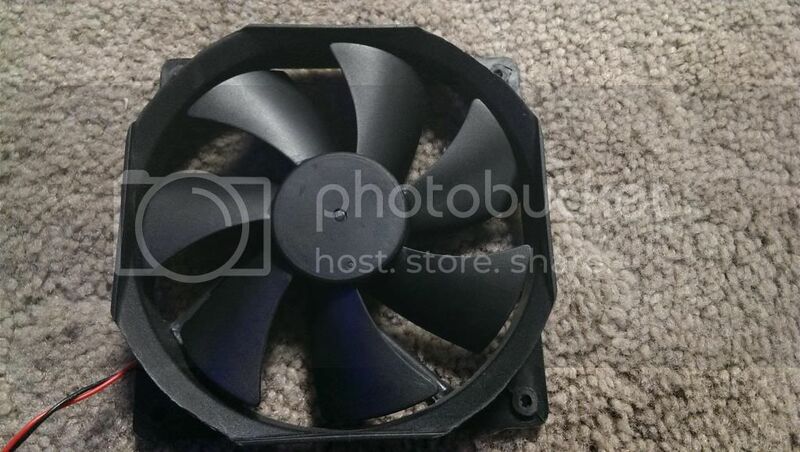 So I started working on another fan to help move more air. I took a 120mm PC cooling fan and just laid it on top of the hood over the vent slots for a couple of weeks to see if that was enough. The tank still changed temp about 2.5 degrees from morning to evening but I was fine with that. So I started to make plans to mount the fan. I removed the hood and pulled the entire heatsync out of the hood to decide where best to put the fan. As I was doing that I decided to test fit the heatsync into the hood with the fan to see how much clearance there was. There was none. In fact the heatsync was no where close to touching the posts that it mounts too. 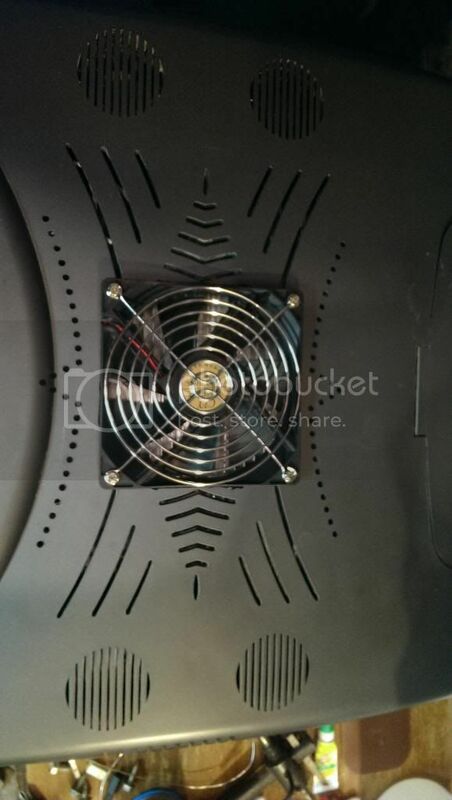 So plan B.
I looked online for a 120mm fan that was thinner to fit in the space. 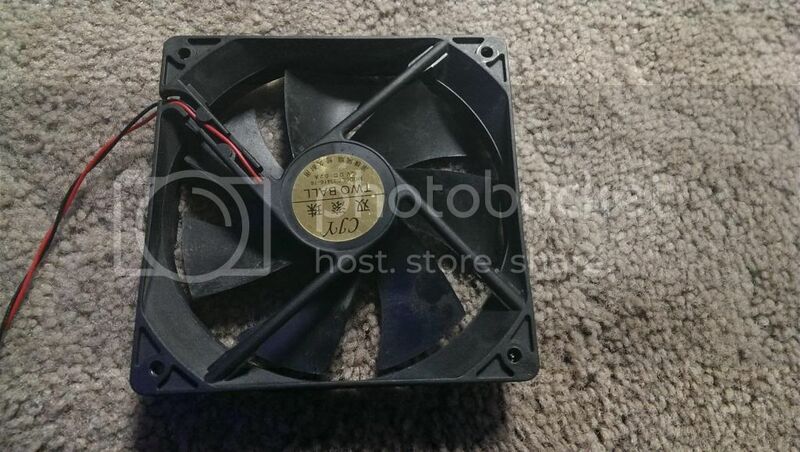 The problem with all the ones I found was that they were so thin that there were no ball bearing version (needed for good long life) and the CFM rating on them was less than half of the fan which I had tested. Plus the reviews on all of them said they were either noisy or didn't last. I decided to trim the tabs off of half of the fan I had been using and then allow it to stick out of the top of the hood a small amount as a compromise. 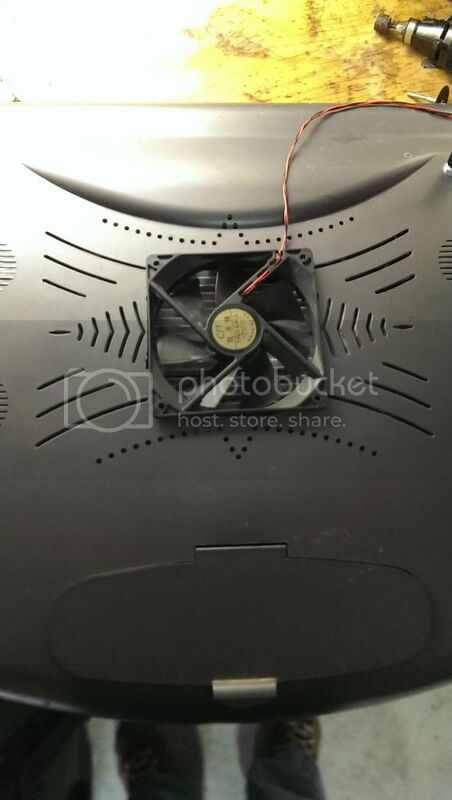 So first thing is modify the fan. Here's the pics. I used a dremel with a cut off wheel to cut the ears off the one side to get this. Then I marked the top of the hood where the fan hole would be cut. I used my trusty dremel with a cutoff wheel again to cut the hole. Heres the fan fitted in the new hole. Then I had to flip it over and remove the heatsync to route the wires and connect the power. 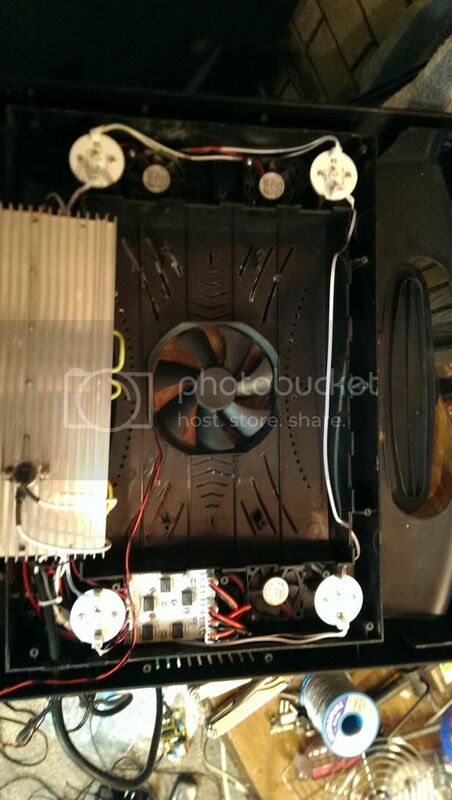 Here is the inside with the fan in the hole and the wires run to the inside. Here is the heatsync back in place and the wires being soldered and heatshrink tubing applied. Here is a picture showing the cord side of the hood. 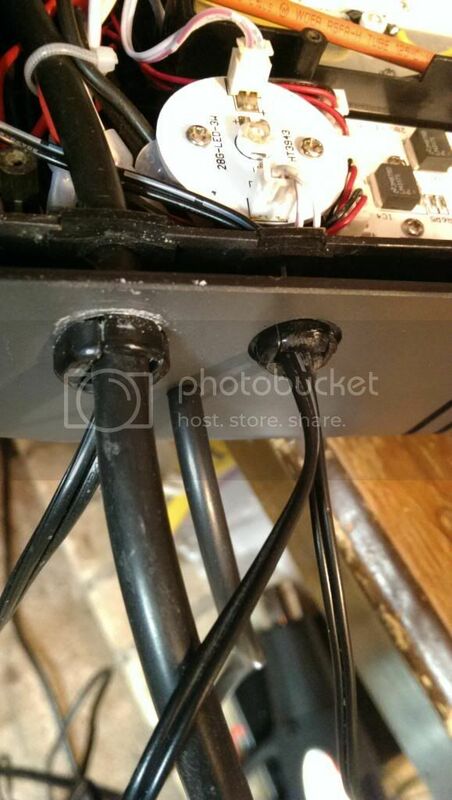 The powercord for the new LEDs is the PC powercord at the bottom right of the picture with no grommet. I just drilled the hole just slightly smaller than the cord and forced it through the hole to create a seal. 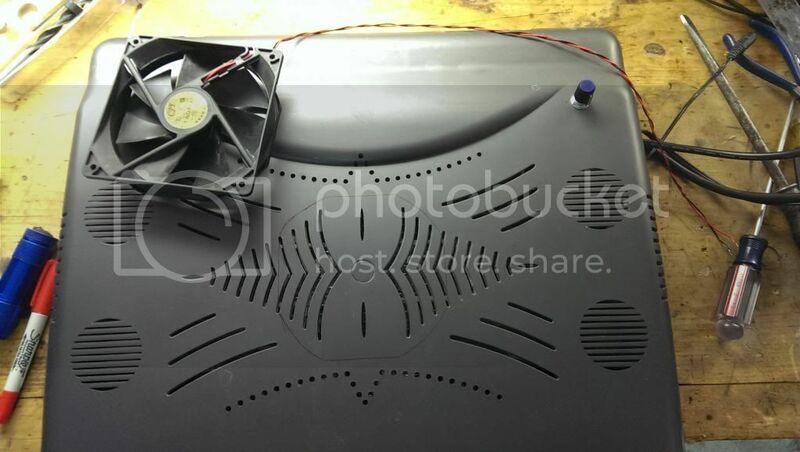 The power for the fan goes through the grommet on the top right along with the moon light LED wire that was already there. Here is the fan mounted with the grill on top ready to go back on the tank. 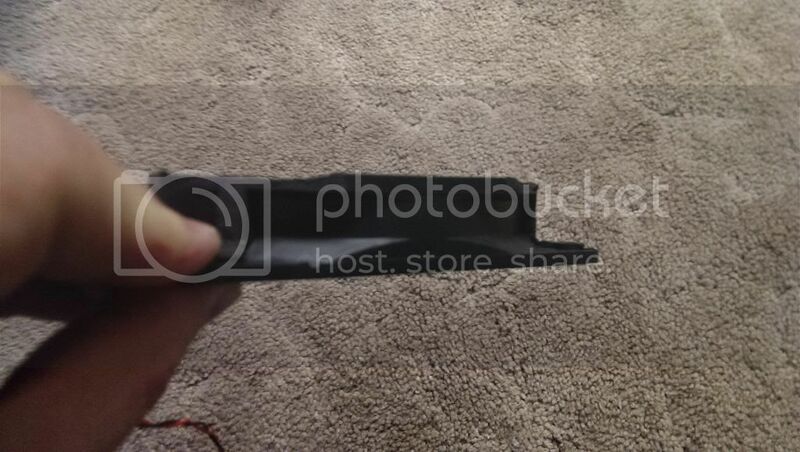 I will be replacing the metal grill with the black plastic one I ordered from Amazon as soon as it gets here. So here are the pictures of the new LEDs on and working. Let me know what you think. New pics to come very soon. I added a skimmer, upgraded my ATO and got the first portion of my doser ordered. I havea bit of GHA that I am cleaning up at the moment that is the result of me being in a hurry to change out my GFO and not checking the flow afterwords. When I got home from work the water was completely cloudy and everything in the tank was covered in a very fine rust colored dust! I've gotten all of the dust cleaned up and luckily nothing died from it. 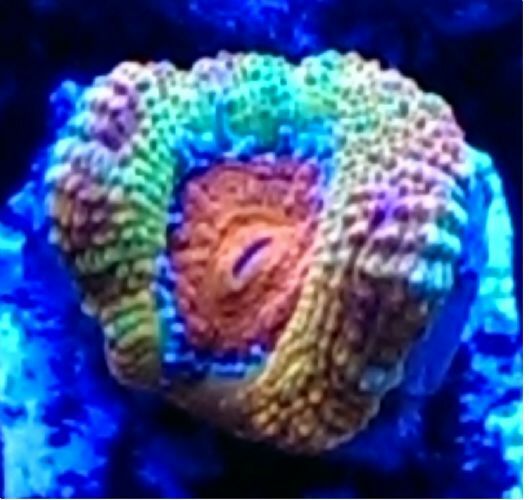 I did get a bit of bleaching on a couple of corals and this lovely GHA bloom but I have switched out all my media now and ordered in the next sets to get that all under control again. Thanks man! I love your 60 rimless! Wait till you see the new stuff that I'm acclamating and moving up on my rocks! Can't wait to take some more pictures of this stuff under the new lights! Here's a little teaser to hold everyone over until I can get things cleaned and ready for the full photo shoot!